Spring cleaning comes in many forms. At our house this includes working on our pond and preparing it for the Summer ahead. We are in the ugly before pretty stage right now. The frogs have started croaking their mating call around the pond a little. I've only heard it a few times but it's a sure sign of Spring, dont' you think? You have no idea how many little baby frogs we end up with later in the Summer. They are precious. Here's the love of my life hard at work. What's on your SPRING CLEANING list? It's exciting to me to shake the dust off and make everything all clean and shiny. I admit to a love affair with having things clean and where they belong. This is no small task with three men in the house and two dogs! Believe me, my broom and vacuum work hard. I don't mind. Have a great day! Don't forget Kari & Kijsa's Pillow Parade on Tuesday. I am so jealous that you are able to work outside already. We are still having mixed weather. All weekend it rained/poured. This morning we woke up to ice on the roads and schools being delayed. Still stuck inside, but thanks for the hope of being outside! We, too, have pond- and waterfall-cleaning on our spring cleaning list. We've already trimmed the water plants and shrubs around it, but still have to drain it and clean the rocks. It will be so nice when the plants start coming back and the water's all sparkly clean. We also have hundreds (maybe even 1,000s!) of little baby frogs during the summer. I'd love to see pictures of your pond. I'll check out your previous posts to see if you have any photos of it. Oh Stacey - I'm so jealous of your being able to be out there spring cleaning in the yard. It's still in the frezzing temperatures here, and today it's snowing/raining. I've got about another month before I can really go out and tackle some of my projects, but the brick patio and pergola are on the top of my list. Can't wait to see pictures of your beautiful pond. My Grandma's words and my mother's words echo in my mind every Spring. Time to clean and organize. We are having some of my husband's family staying with us for five days, in two weeks. I am busy cleaning and organizing, although I do not hear any frogs while I am working. You remind me of a very organized person. I wish he could come work on mine and make it look more like yours! I don't seem to have frogs. Think you just buy them and they have babies? Or did they just hop on over to live at your house? I have to admit, I like to organize, clean and have everything in its place too. But I don't have all those males to contend with! I do enjoy Spring cleaning! I love having a clean, organized home indoors as well as outdoors. I'm ready to get started and plant Red, Yellow and White flowers. I'n not sure what kind yet. I always stay with those colors though. My husband is still awaiting his official military orders. I am so tired of not knowing. Ugh! We have a very slim chance of staying here. Thanks for coming by and checking out our lighting. We need to tackle the garage and dig out the kiddie pool, wagon, bike, etc. Last night we drove by a little pond on the way home from church. The frogs were out in full force! So loud! Spring is definitely here! I hope we will get to see your pond in it's glory. I would love to have a pond in my yard. Are they a lot of work? That is so cute about the frogs and their mating calls. I worked in three of the multitude of flower beds this weekend trying to get them cleaned out.... We are doubling the size of the garden so barring rain later this week, my son will be making new raised garden beds.... Spring cleaning sometimes is overwhelming but very rewarding. Love your hubby and your pond. Stacey, I just did a post about getting some things done for Spring this week and I said I wouldn't be doing anymore posts until later this week. Then....I come by here....and see a pillow parade anoucement....for the 10th....Oh, what will I do...lord knows I have plenty of pillows and would love to join in on that one! 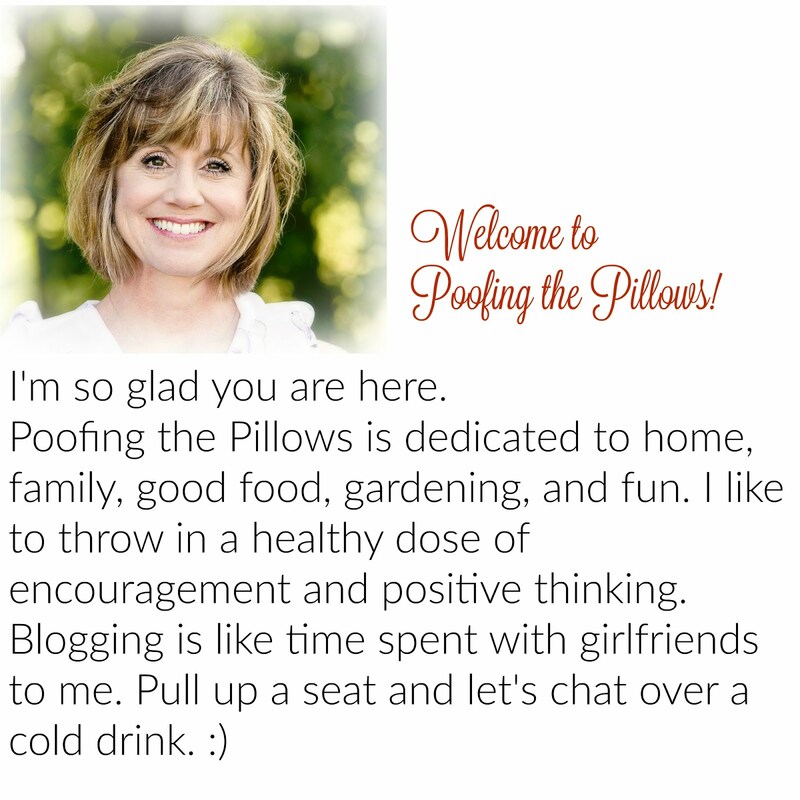 Okay, if I get up from this computer and work until I drop...maybe I can join in the pillow fun on the 10th..I am going to try!!!! Hi Stacey! How nice to be able to get out and start cleaning out things! I don't have any plans right now. I'll just do what I can when I can. I am so far behind in my cleaning that I think I am ahead ! I need to stay off this computer.LOL .